Simon & Schuster/Paula Wiseman Books, 9781534412552, 256pp. The creepy, atmospheric island gives the boy space to work through heavy issues, such as abandonment, death, and toxic masculinity....If readers are brave, like the boy, they will gain strength and insight from their time on the island. An unforgettable, life-affirming tale. In this touching debut, the real-life identity of the menacing wolf is a surprising twist, as is the true nature of the boy’s predicament. Clark writes with a lyrical and appealing rhythm, as she viscerally explores childhood emotions of fear and anxiety relating to bullying, abandonment, and getting lost. Weighty themes like courage, love, will, and care for the defenseless haunt this archetypal journey. The path is also filled with rich symbols, such as a blanket and the titular beast and boat. With a sharp focus on the isolated protagonist and his internal struggle, it is character development that shines most clearly, though the external environmental dangers and the mystery keep the suspense taut....A poignant story. In the process, his journey across the island becomes a modern-day allegory of the powers of fear, resilience and hope. It’s not until the haunting end that the boy, and readers, finally learns how he came to the island and a difficult choice he must make regarding his fate. While The Boy, the Boat, and the Beast can be a quick read, this debut novel should be savored for its atmospheric setting, ominous tension and the beautiful way it brings light to the darker parts of childhood. Clark’s melodic prose, packed with otherworldly imagery and affecting repetition, effectively sets the boy’s fears in a larger context....This first novel from Clark offers unusual imaginative and emotion-driven introspection, earning its several allusions to The Little Prince. [The boy]’s struggle to overcome his life-threatening fears illuminate how difficult it is to navigate the seas of growing up. His victory is a victory for all of us. — Kathi Appelt, Newbery Honor-Winning Author of "The Underneath"
The Boy, the Boat, & the Beast is a well-crafted mystery-thriller with interlaced questions, each demanding its own answer. Who is the boy? How did he come to be so all alone? And how will he survive the hideous beast stalking every step he takes? This page-turner takes readers on a journey through one boy’s darkness and redemption, and his determination to outwit a monster that seems to know his terror only too well. With only a precious bit of [fabric] to guide him, he blazes a trail of courage and determination as he refuses to give up on his family—or himself. The story speaks to the deepest level of heart and psyche, about facing the worst that fear has to offer, about determination and force of will, and about how the threads of love joining families together refuse to fray, despite storms of imperfection, pain, and foolish choices. — Susan Vaught, Edgar Award-Winning Author of "Footer Davis Probably is Crazy"
"The Boy, the Boat, and the Beast is part action-adventure, part dreamy allegory--a painful, beautiful, mysterious read. Samantha Clark has given us a boy whom we love, fear for, and will not soon forget." — Liz Garton Scanlon, Author of "The Great Good Summer"
A journey of determination and self discovery, Clark's The Boy, the Boat, and the Beast asks us each to face our deepest, darkest fears. This mysterious gem of a book offers us solace and safety, without one note of false hope. Masterful storytelling. — Bethany Hegedus, Author of "Grandfather Gandhi"
In this poetic, unique debut, Samantha Clark draws the reader into the story of a castaway boy who has lost everything, including his memories, and is hunted by monsters both inside and out. As the boy desperately scrambles to find his way home, Clark traces lines of fear and hope, courage and despair, in the sand. The Boy, the Boat, and the Beast is an enchanting exploration of the power that resides in the stories we tell ourselves, and how we can change those stories... and possibly our own destinies. Heart-wrenching and hope-filled. — Nikki Loftin, Author of "Wish Girl"
Lyrical and heart-catching, The Boy, The Boat, and the Beast is also a page-turner of a mystery with a profoundly satisfying conclusion. A book for any child—or adult—who’s ever had to fight with fear. 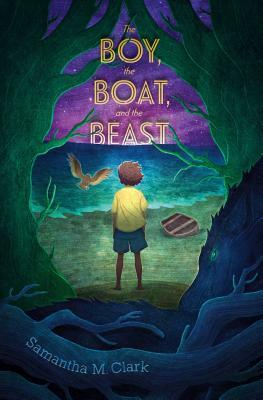 — Katherine Catmull, Author of "The Radiant Road"
Lyrical and evocative, The Boy, The Boat, and The Beast offers young readers an emotional connection with a boy who must master his fears in the face of frightening and unnatural monsters. Several unexpected twists during a heart-stopping final act cap Clark's fine debut. — Janet Fox, author of "The Charmed Children of Rookskill Castle"
Lyrical and hauntingly beautiful, this is a story for everyone who’s had to learn to face their fears. — Jennifer A. Nielsen, Author of "The False Prince"